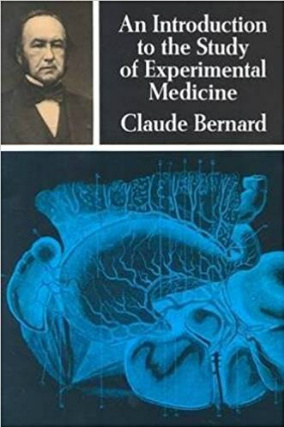 An Introduction to the Study of Experimental Medicine, a masterpiece and a classic book which is still read, is written by Claude Bernard, the father of modern physiology and experimental medicine. 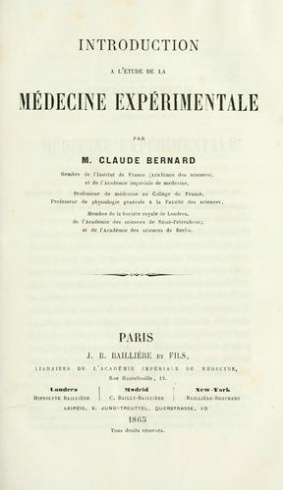 In 1865, forced by sickness to abandon his teaching and research activities, Bernard wrote this book, establishing as general principles his thoughts about experimentation in physiology and medicine. The book represents a clear and penetrating presentation of the basic principles of medical research from this great French physiologist. It was said of Claude Bernard, “he is not merely a physiologist, he is physiology”. Alexis Carel also said of Bernard: “Before him, medicine was purely empirical. 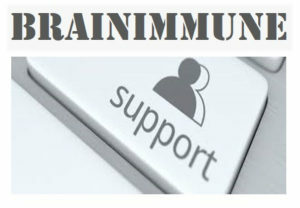 He is responsible for the introduction of the scientific method in the art of healing”. The ‘Introduction’ was written by Bernard at a “period of his scientific career when grouping of facts and theorizing began to take precedence over noting of details………Medicine has passed through the empiric, the systematic, the nosologic and the morphologic stages and has now entered the experimental stage. Bernard envisioned physiology as the foundation of experimental medicine and a larger part of biology”. In his book Bernard introduced some major principles of modern experimental medicine such as: Truth versus Falsification; Determinism and Averages; Authority and Observation; Induction and Deduction; Fallibility; Cause and Effect; Known and Unknown and Discovering vs. Despising. “When we meet a fact which contradicts a prevailing theory, we must accept the fact and abandon the theory, even when the theory is supported by great names and generally accepted”. “The complete scientist is one who masters both theory and experimental practice: 1, he observes a fact; 2, he conceives an idea with reference to this fact; 3, on the basis of this idea he pursues a line of reasoning, plans an experiment and imagines and organizes its material conditions; 4, this experiment produces more phenomena that shall be subjected to observation and so on. In a sense, the scientist’s mind is always between two observations: one is the starting point of the reasoning, the other its conclusion”. In the ‘Introduction’ Bernard also brought the concept of the constancy of the internal environment or ‘milieu intérieur’ and wrote that “La fixité du milieu intérieur est la condition d’une vie libre et indépendante” (“The constancy of the internal environment is the condition required for a free and independent life“). Bernard was well aware that anatomy remained the basis of physiology, but he made it clear that physiological processes cannot be explained on the basis of the sole anatomy. This new concept entailed the overcoming of the concept of physiology as ‘anatomy in motion’ and a radical shift in perspective. The concept of the constancy of the internal environment was further developed about 50-60 years later by the American physiologist Walter Cannon, coining the term and advancing the concept of homeostasis. Series: Dover Books on Biology; Paperback: 272 pages; Publisher: Dover Publications (June 1, 1957).